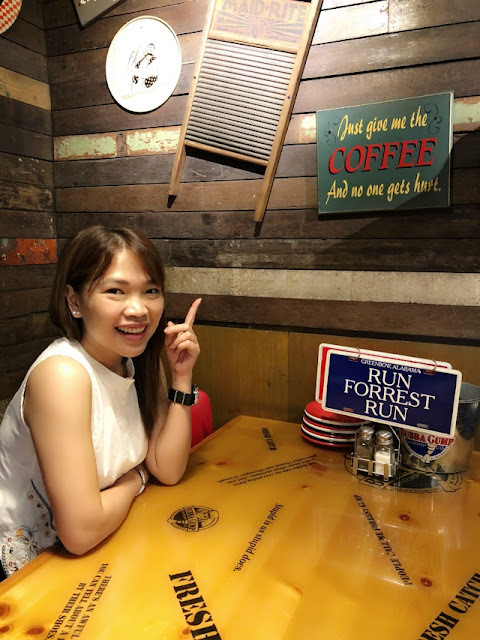 Weekend Food Trip at: Bubba Gump Shrimp Co. But as we grow older, priorities changed, Food is Life na - aside from Coffee. It was one of those weekends we go out with my husband's family. I've decided to never mind the drive from Manila to Makati on a Sunday but heck was it super traffic at Roxas Blvd. We hoped the food would be worth it for the hour plus drive! Sauteed in hot and spicy Cajun Butter sauce. Served with garlic bread for dipping. If all things fried is what you want, this is the best platter for you! Loved everything in here and I'm glad I don't taste the old oil-taste! My favorite? Hmm, can't really pick one but loving the shrimps and the hush pups. 2 pieces grilled pork chops served over jasmine rice and succotash. The downhill after all the "uphill". This dish came out super dry, the meat is really hard to chew. The succotash (greens) are yummy though! But didn't finish this plate! and herbed white sauce with spinach. I'm a fan of anything creamy with spinach on it! Loving the thick slice of salmon and this dish is really tasty and flavorful! I love the restaurant ambiance, it is bigger than what you see outside and I enjoy looking at decors and items that brings me back to the movie Forrest Gump! I love the service of the restaurant and I just wish they are consistent with the food they serve as I read reviews on how great their food was! Have you tried Bubba Gump? Any other food recommendations since I plan to go back?